House pet not hunter: what does it mean? This bit of artistry sums it all up. Look at the beagles, tails a'wag, romping happily. They are blindly oblivious to the rabbit peeking from his hole a few inches away. He even looks bewildered by their behavior. The Queen Elizabeth Pocket Beagle's attention is on its playmate and YOU. Occasionally we're asked, will they run a rabbit? We are sure some would. 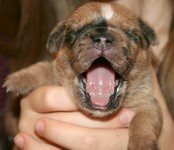 But we do not guarantee this kind of nature as they have been developed for the past decade to be a companion breed. Please enjoy the following musical video parodying the Queen Elizabeth Pocket Beagle as a hunting dog. The Queen Elizabeth is a different breed of beagle. It is a housepet, not a hunter, and they shower their family with devoted attention. They are content inside and not as restless. They love a walk with you and can keep up with your activities. But they would also be adaptive to a single room lifestyle as they get most of their exercise just running about the house. But this is greatly by your individual preference. Queen Elizabeth Pocket Beagles follow your lead. If you have an active lifestyle they can keep up. If you want to teach them agility they can do that too. They are still beagles at heart and love to explore. What is a Queen Elizabeth Pocket Beagle? 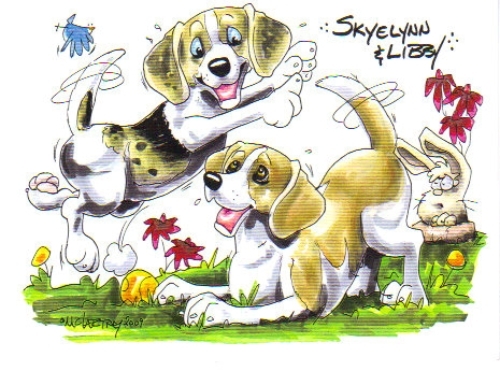 Pocket beagles are commonly marketed as miniature or pocket in name but in genetic background they are simply small beagles, and have the same high energy hunting instincts. A Queen Elizabeth Pocket Beagle is a unique breed created by originally blending beagle with another breed. They require less exercise and are content in the house. Seldom barking, very few learn to bay or howl. This makes them suitable to be apartment dogs.